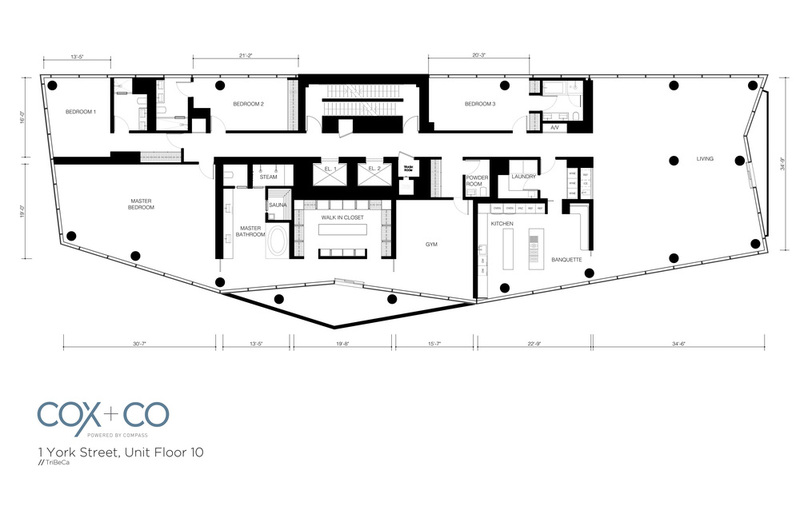 Currently three units, the 10th floor at One York Street provides an incredible opportunity to custom design your own floor-through luxury residence in one of TriBeca’s most exclusive buildings. Whatever your desire for the layout and design, you will bring that vision to life – with the elevator opening directly into a space that will suit your taste, and awe you every day. With walls of windows surrounding you, views of several iconic buildings, and the finest finishes at every turn, imagine living in the most heavenly setting in the city, and the reaction of your guests as you entertain in style. This amazing dream home is even more appealing with two parking spaces in the automated garage and 300-square-feet of storage space in the temperature-controlled cellar, which are included with your purchase. It also boasts a great location, right at the crossroads of TriBeCa and Soho, near abundant transportation and some of the chicest shops and restaurants downtown. One York Street is a boutique 33-unit condominium with a pet-friendly policy and full-service amenities that include a full-time doorman, onsite resident manager, porter, fully-automated private Swiss-engineered parking garage, private health club, central air conditioning, storage, a wonderful 28′ outdoor heated swimming pool and 2,200-square-foot sun-deck oasis with an outdoor shower. Common Charges: $4,651 / mo.